Starved for attention and looking for a home, Smokey the shelter dog was alone and scared. Despite being depressed for so long, Smokey’s frown has been turned upside. This heartbreaking tale of an abandoned dog will just tear you up inside and make you want to show your own pet ten times more love. Stay tuned to the end to find out what happened to Smokey. Who could believe that such an angelic face would have an incredibly hard time finding a foster home? Well, that was the case with Smokey a gorgeous dog that was left behind at a shelter after his family lost their home. Timid and scared of his new environment, Smokey was not doing well without his family and the comfort of his home around him. 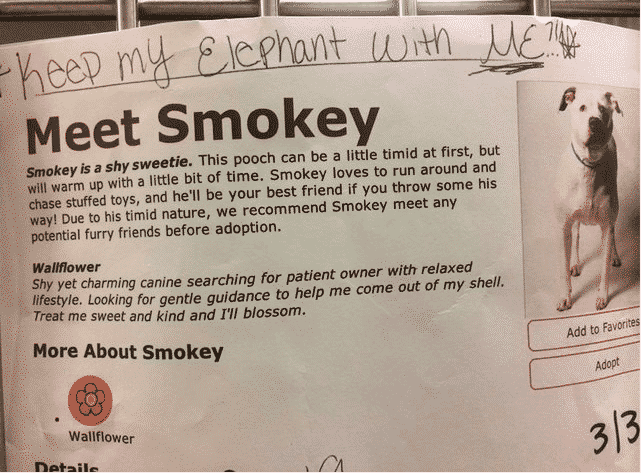 Smokey was left behind on Valentine’s Day after his owner acknowledged that she could no longer care for him after losing her home. 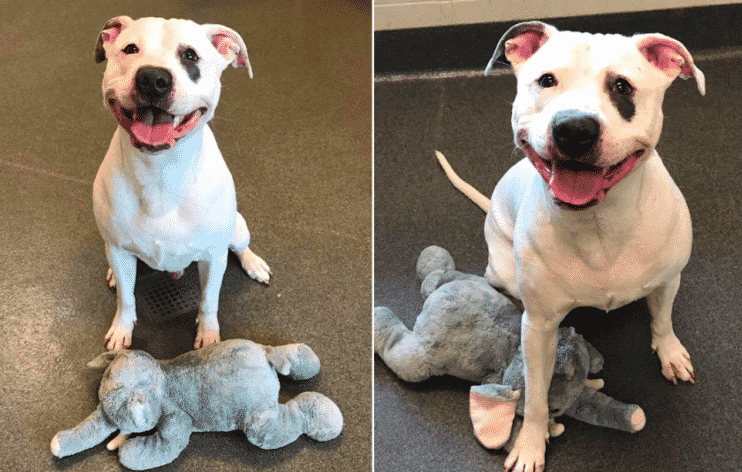 Sitting alone in a corner of the Franklin County Dog Shelter & Adoption Center in Ohio, Smokey could only be found holding tightly onto his best pal, a stuffed elephant with bright pink ears. No one could have predicted how much his adorable friendship would end up impacting Smokey’s life. 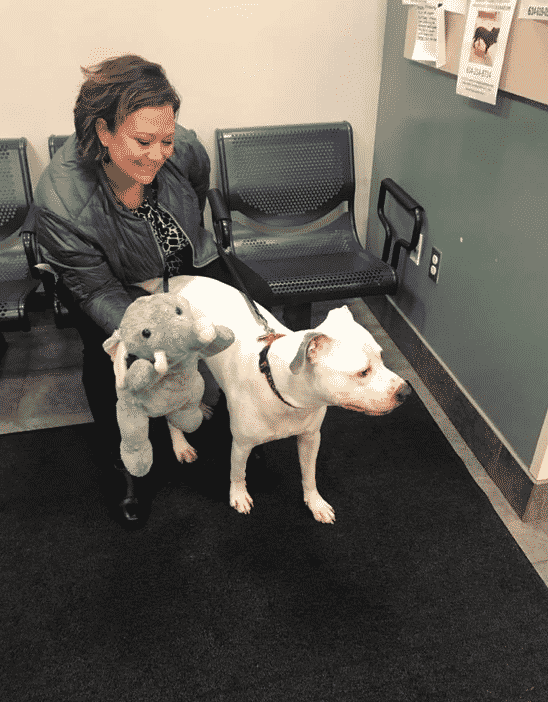 Smokey’s owner dropped him off with the elephant, aware of how attached he had grown to the plush toy. The toy brought him comfort during such a stressful time and Smokey could be found cuddled up with the plush while shying away from others. 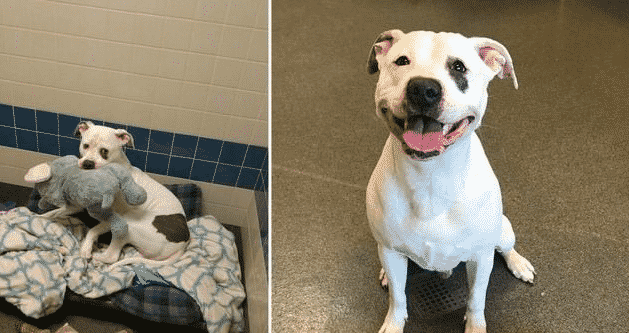 The adoption center assumed his shy behavior would keep him from being adopted so they never expected what would happen in just a few weeks time. 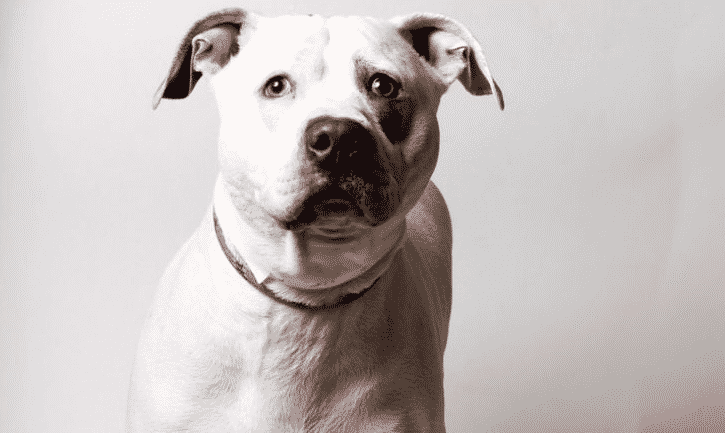 Due to his fear, discomfort and shyness, Smokey wasn’t coming off as the friendliest dog. He would growl at visitors and hide away in a corner with his elephant by his side. Since he was giving the adoption center such a hard time, they could no longer place him in the public adoption process. 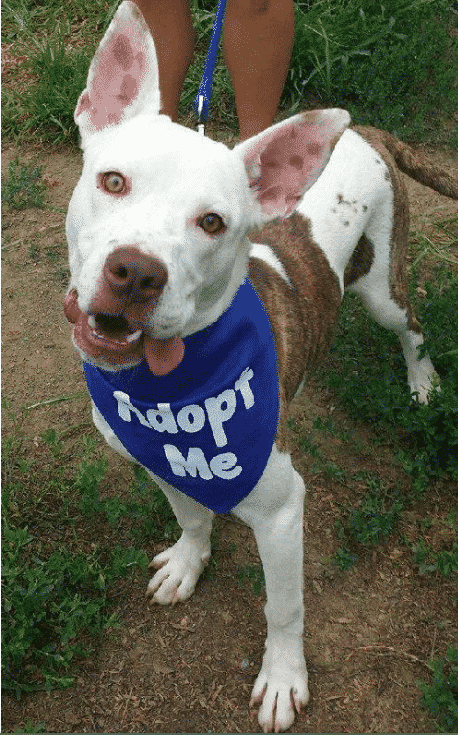 Without the public adoption as an option, he was going to be euthanized in a month. The adoption center need a new plan, and fast..
With his depression and agitation getting worse, Smokey’s growling only continued. The adoption center tried their best to look over him and comfort him, but they began to realize that there was only one choice left in order to save Smokey’s life. The center began to make use of word of mouth communication and social media posts. But it was one unexpected turn of events that would change Smokey’s life forever. 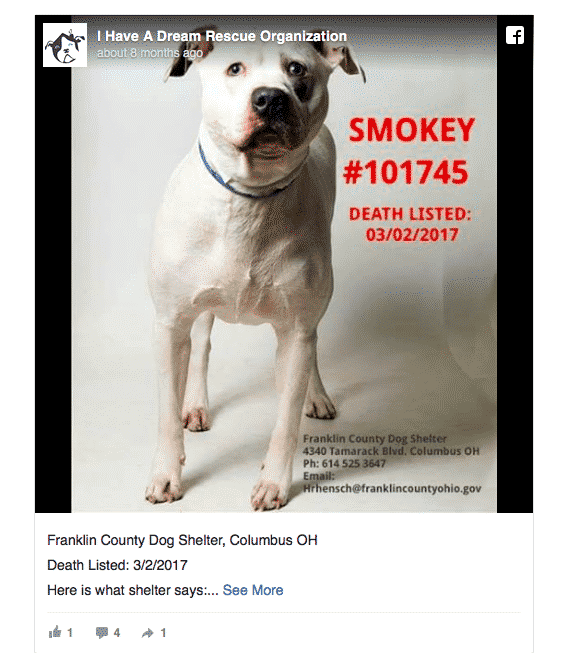 Franklin County Dog Shelter & Adoption Center spokesperson Susan Smith stated that, “He’ll do much better when he’s out of the kennel. He’s going to do much better in a different environment.” Her statement rang true when visitors from the I Have A Dream Rescue Organization came to the adoption center. The visitor’s reaction to Smokey’s cuddly behavior stunned everyone! 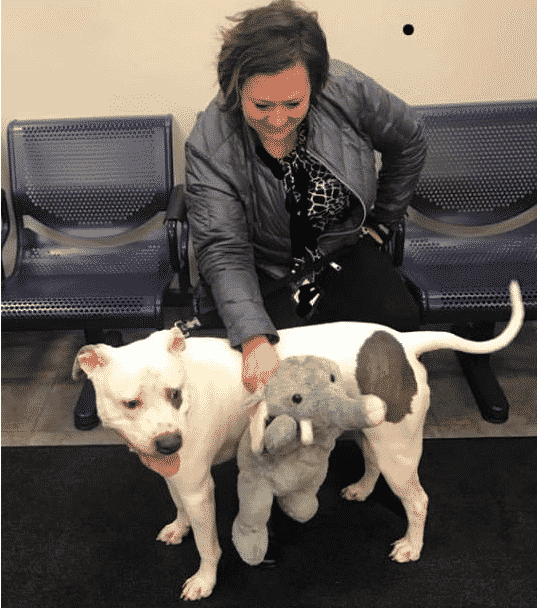 While on a mission to evaluate another rescue dog named Roger, Misti Martin-Fuller, founder of the I Have A Dream Rescue Organization, fell in love with Smokey. What really caught her eye? Smokey’s absolute adoration of his stuffed elephant. From that point on Misti knew that she had to take an initiative in Smokey’s situation and help him through his struggles. And it turns out that Misti wasn’t the only one to fall in love with him afterwards! Smokey’s cuddle session just won him a newly committed group that is now personally dedicated to finding a foster home for him. The foster home will hold onto him until his original owner can take him back or until he goes through a safe adoption process. Excited Internet users began raving all about Smokey on the group’s Facebook page. Hundreds of inquiries began pouring in asking about the adorable dog with the plush pal companion. The Facebook post instantly went viral. The I Have A Dream team is weeding through the responses in order to find the best home for Smokey. Smokey’s original owner took to commenting on the I Have A Dream’s Facebook post, thanking them for taking care of her baby when she could no longer be there for him. In the meantime, Smokey has been happy to hear that he’ll be in the comfort of a new home soon and aware from the stress of the shelter. His elephant has been pretty stoked too. If you don’t believe us take a look at Smokey for yourself in the next slide! That smile is all the proof you need! Smokey’s smiling face is proof that you too can bring a smile to a dog’s face by providing them with a new and loving home. You may not know this, but dogs are known to attach to other fluffy friends! Want some proof? Check out the next couple of slides for an absolute cuteness bonus! 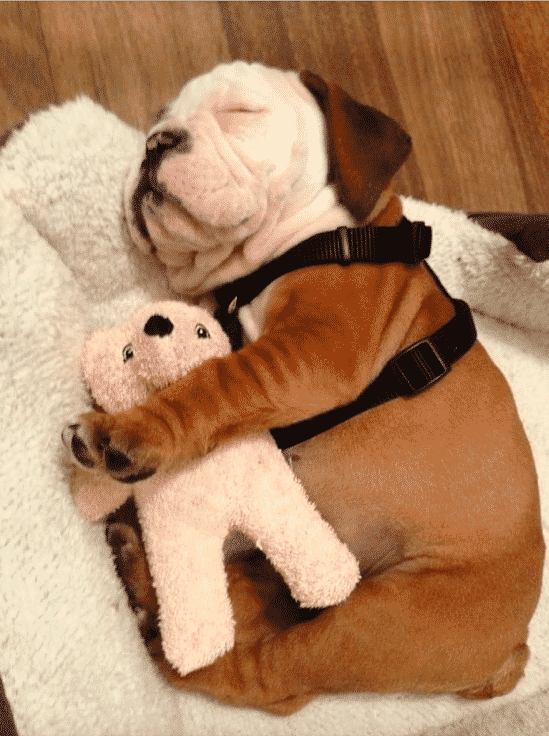 Check out this adorable little puppy cuddled up in bed with his stuffed bear! 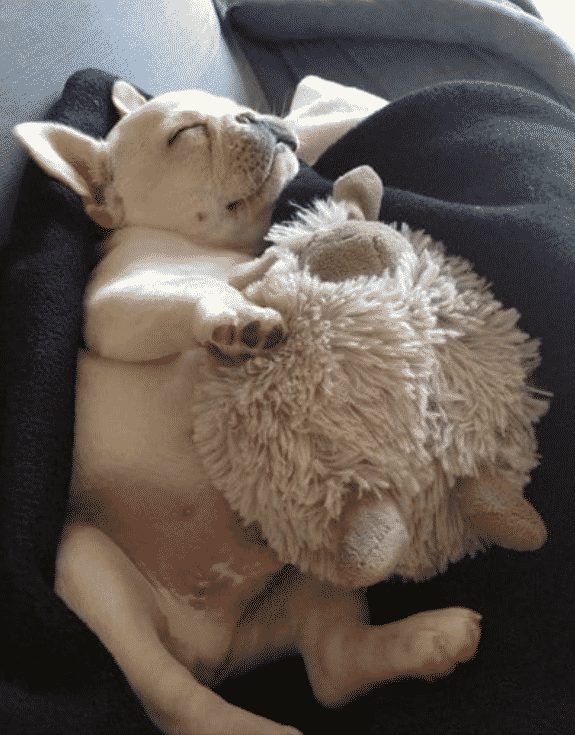 This little bulldog puppy and his pal are absolutely inseparable. We’re more than sure that the pair will grow up together – even if the bear stays the same size. 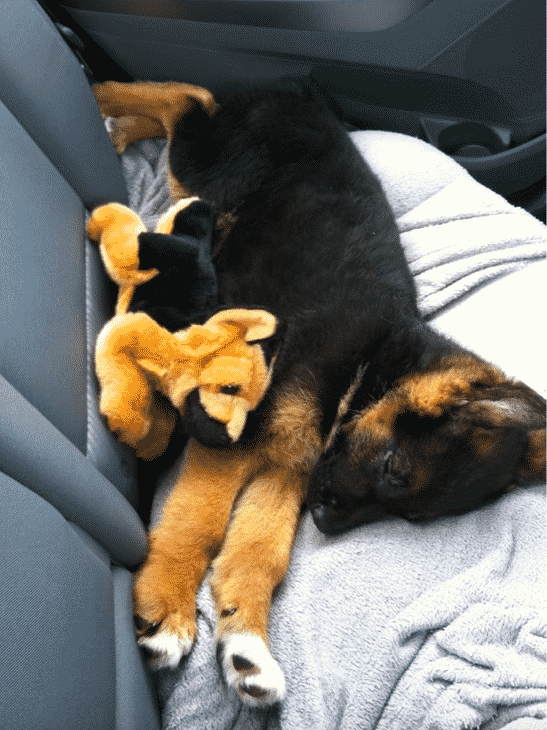 Here’s another adorable pup with his longtime stuffed companion. Talk about having a good self image! 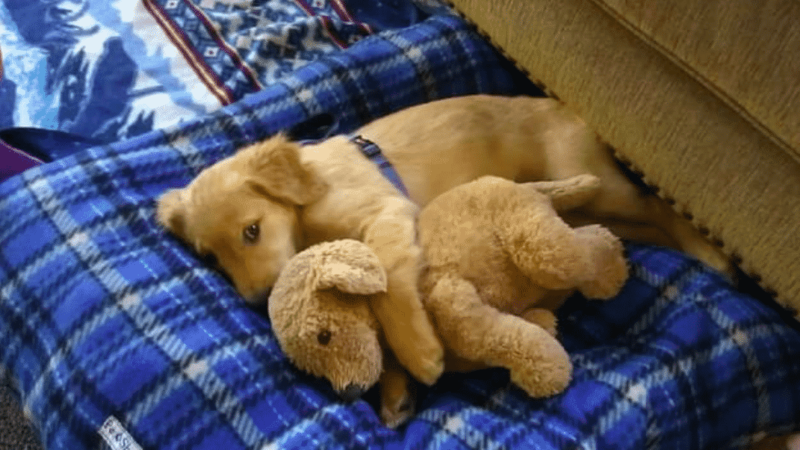 This pup loves himself so much that even his stuffed toy is just a mini version of himself. 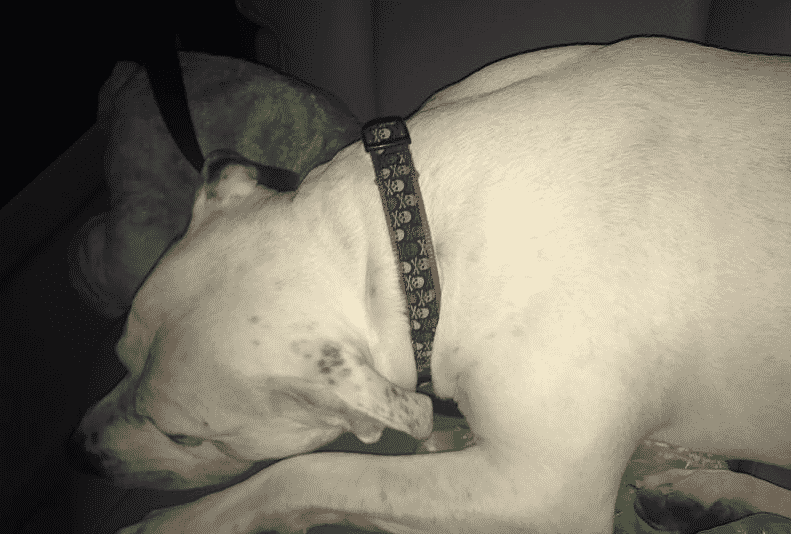 Look at the two of them cuddled up in the backseat of a car – absolutely darling. 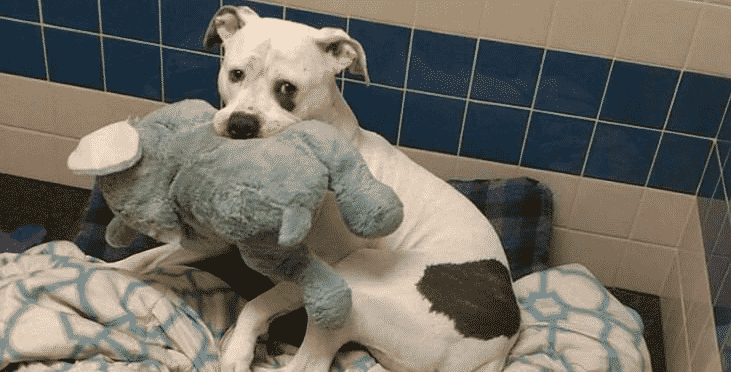 Have you ever wondered why dogs love stuffed animals so much? We’ll reveal the hidden truth in the next photo of a sweetheart cuddled with a little lamb. This pup sure does looks snuggly with his little lamb. So have you wondered what causes such an attachment between dogs and stuffed animals? If you happen to have a pet dog you may have noticed that they’ll carry around their stuffed friend for playtime and nap time. Well one theory is that dogs enjoy carrying things in their mouth, this is especially true for golden retrievers. However, there is a second theory and it’s quite interesting! You’ll never guess what else motivates them. Just take a look at this golden retriever and his twin brother! Could you even tell which one is the real pup and which one is the stuffed animal? So what’s the second reason that dogs like stuffed pals? Well, it seems that they enjoy collecting and playing with toys in the same ways that humans do – isn’t that something? However, you have to watch out if your pup starts to show some bad behavior with their stuffed plush such as the one we’ll discuss in the next slide. 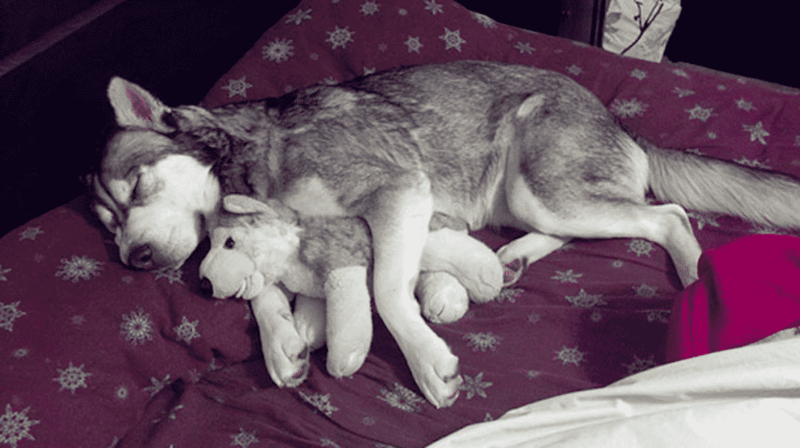 This Siberian Husky and his Siberian Husky plush toy are almost too cute to be real! So what’s the bad behavior that you should be on the lookout for when it comes to your pup and his stuffed plush? If your pup happens to use its plush as a hunting target and ripping it to shreds then it may be time to reevaluate the relationship. As you can see pups loving their plush toys isn’t as unusual as you may have thought. While Smokey’s story is absolutely endearing, it’s not strange of him to have gotten so dependent on his toy. You may not have expected it, but Smokey’s lovable nature and story has begun to improve the lives of other dogs as well! “We have 95 dogs available right now,” Smith told The Dodo. 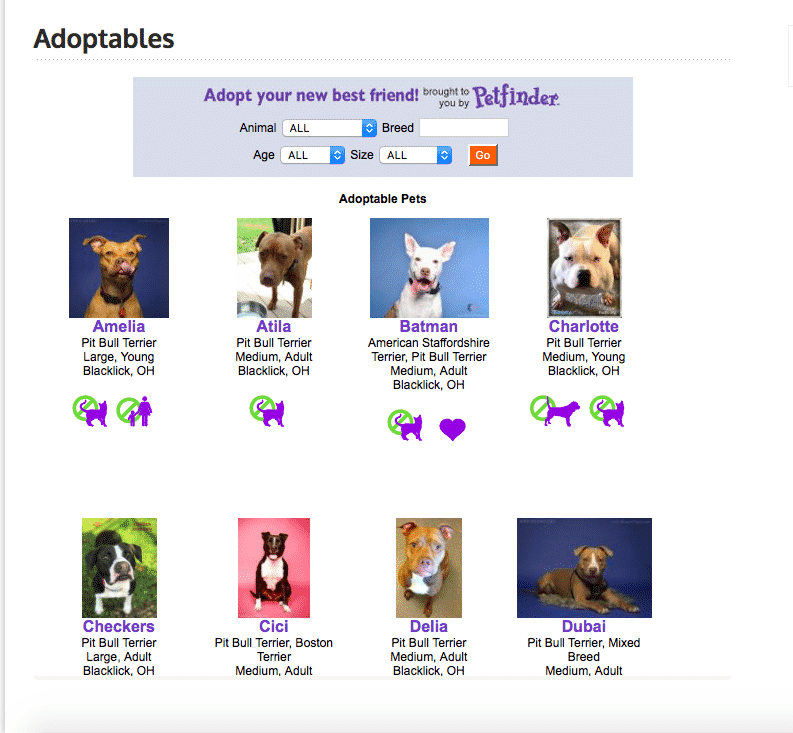 Sounds like a great place to check out if you’re interested in adopting a dog for yourself. The rest of Smokey’s story will definitely leave you inspired about the adoption process. 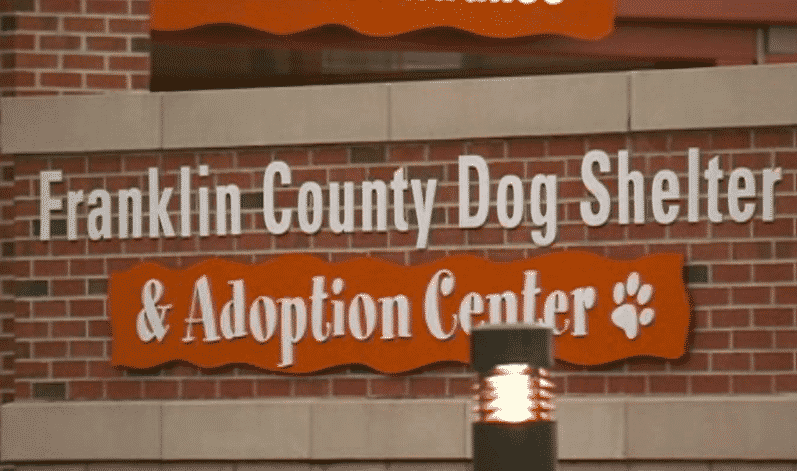 Thanks to the commotion caused around Smokey, the organization has noticed tons of excitement around adopting some of the other dogs from the shelter as well. 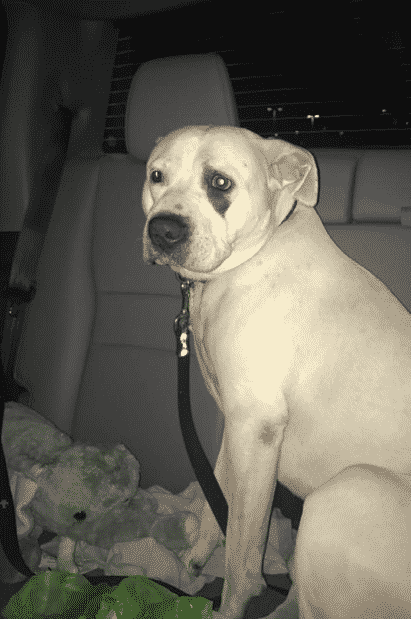 People have been getting super excited about the thought of rescuing a scared, sad pup from shelter life. If you’re interested in some of the cuties available take a look at the next pic! 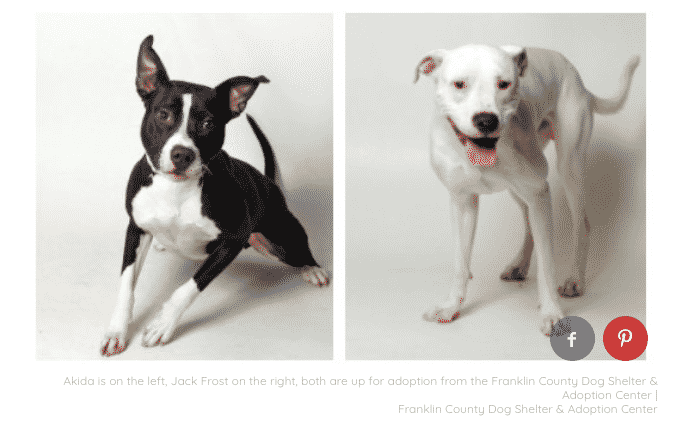 One of the cuties available is Akida, a playful and friendly girl that is looking for a loving home and Jack Frost, a dead dog that is learning sign language. These smart and friendly pups are just some of the other dogs that are looking for someone to provide them with a home filled with love and security. After all, who could deny faces like theirs? To see more cuties keep reading on! 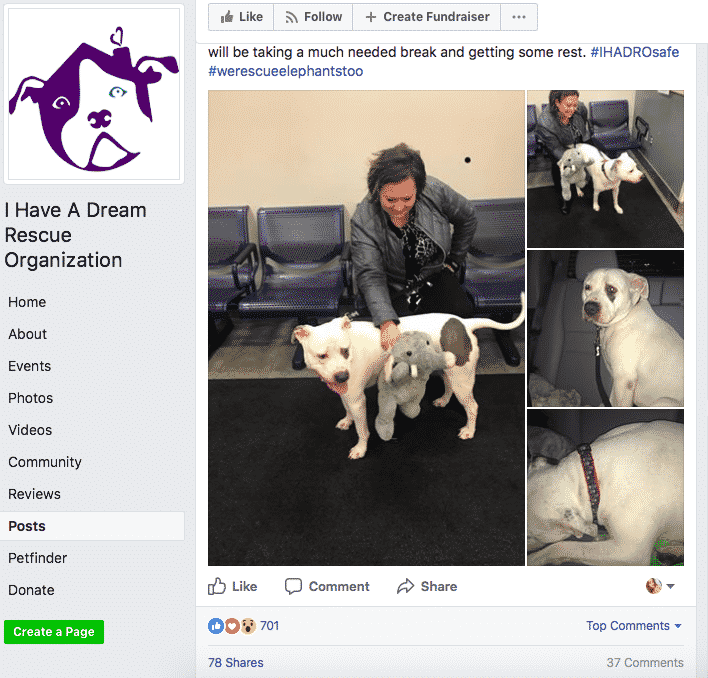 If you’re interested in supporting Smokey’s cause or any of the other dog’s then check out the Facebook page of the I Have A Dream Rescue Organization. With tons of dogs looking for a new home maybe you could be the next owner of a lovable pup like Smokey!